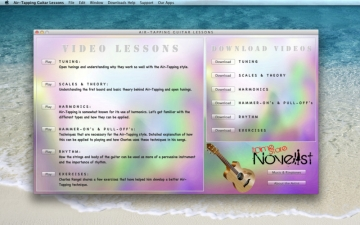 Air-Tapping Guitar Lessons | Mac App Storeのアプリ検索・ランキング BuzzMac! Rolling Stone "Street to Stage" WINNER! After recently winning the Rolling Stone "Street to Stage" competition by public votes, Charles Rangel of The Dime Store Novelist has decided to share his Air-Tapping Guitar secrets, exercises and techniques with the world. 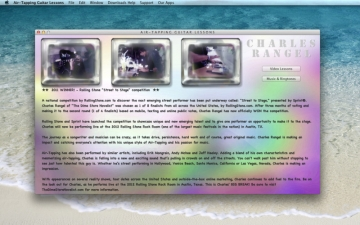 Charles Rangel has put together 6 detailed video lessons (over 37 minutes) that will take you step-by-step into the Air-Tapping Guitar style. He will demonstrate all of the following in detail: Tuning, Scales & Theory, Harmonics, Hammer-On's & Pull-Off's, Rhythm, Hand & Finger Placement, Tapping Gestures and Exercises. 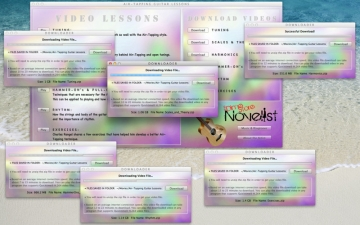 As an added bonus to the video lessons, Charles is giving you 12 MP3 Music Tracks and 30 of his top selling Air-Tapping Guitar Ringtones from the U.S. cellular networks, for free. 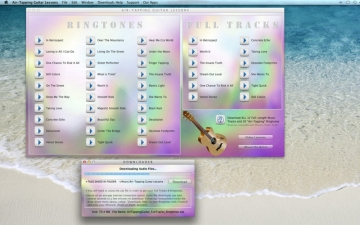 Set these stunning Air-Tapping Ringtones to your iPhone callers or set them as alarms on iPhone, iPod or iPad devices. 1. TUNING: Open tunings and understanding why they work so well with the Air-Tapping style. 2. SCALES & THEORY: Understanding the fret board and basic theory behind Air-Tapping and open tunings. 3. HARMONICS: Air-Tapping is somewhat known for its use of harmonics. Charles gets you familiar with the different types of harmonics and how they can be applied to Air-Tapping. 4. HAMMER-ON's & PULL-OFF's: Techniques that are necessary for the Air-Tapping style. Detailed explanation of how this can be applied to playing and how Charles uses these techniques in his songs. 5. RHYTHM: How the strings and body of the guitar can be used as more of a percussive instrument and the importance of rhythm. 6. EXCERCISES: Charles Rangel shares a few exercises that have helped him develop a better Air-Tapping technique. A national competition by RollingStone.com to discover the next emerging street performer has been put underway called: "Street to Stage," presented by Sprint®. Charles Rangel of "The Dime Store Novelist" was chosen as 1 of 8 finalists from all across the United States, by RollingStone.com. After three months of voting and making it to the second round (1 of 4 finalists) based on mobile, texting and online public votes, Charles Rangel has officially WON the competition. He will be performing live at the 2012 Rolling Stone Rock Room (one of the largest music festivals in the nation) in Austin, TX. 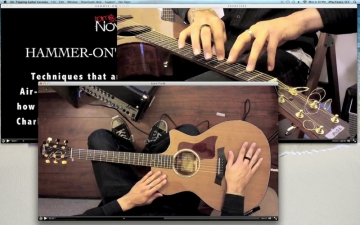 Air-Tapping has also been performed by similar artists, including Erik Mongrain, Andy Mckee and Jeff Healey. Adding a blend of his own characteristics and mesmerizing air-tapping, Charles is falling into a new and exciting sound that’s pulling in crowds on and off the streets. You can't walk past Charles without stopping to see just how talented this guy really is. All computers, handheld & mobile devices that support QuickTime H.264 video. All computers, handheld & mobile devices that support MP3 audio. ** You must have an internet connection to play videos inside the app, download videos or download full tracks & ringtones. NO in-app purchases! ** Instructions to sync ringtones with your iPhone, iPod & iPad are in the drop-down menu, at the top of your computer, called: "Downloads Help."